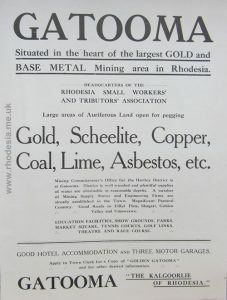 Gatooma is the centre of a rich mining and agricultural district. 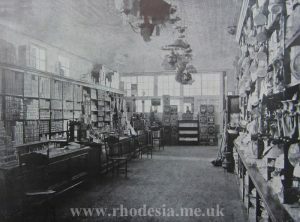 It obtained municipal status in 1917. 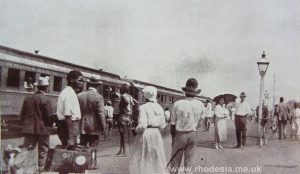 It lies at an altitude of 1162m and its population at the 1969 census totalled 20 940 of which 1 879 were Europeans and 18 740 were African. Fabric weaving on a large commercial scale, based on the locally grown cotton, is an important industry. 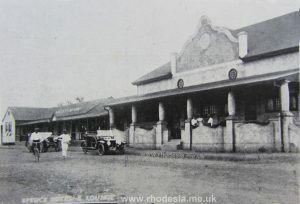 A view of the post office and war memorial in 1926. A view of Edward Street, as in the next photo, taken 25 years later. Note how the newly planted trees have grown since! 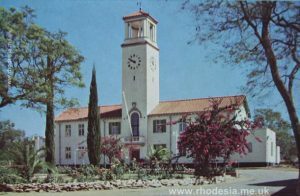 In 1967 the town celebrated its golden jubilee as a municipality. 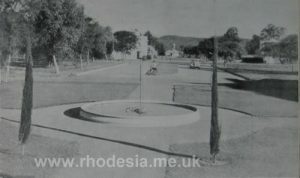 over a Guard of Honour provided by the Rhodesia Light Infantry. The Town House facing Edward Street.